Researchers found that children burn half as many calories in the winter as they do in the summer months. While counting calories probably isn’t a big concern for most parents of growing, active children, activity levels should be. Healthy movement and engagement with the world around us matters, perhaps especially for kids. Which is why finding ways to keep your kids moving and engaged, even in the winter months, is important. Winter activities don’t always have to get their heart rates up (any more than all summertime activities might), but there should be a focus on balance. Health specialists point out that even just a few minutes outdoors a day can do wonders for fighting against the winter blues. I can tell you from experience, even kiddos can be susceptible. From there, finding indoor activities that can keep them engaged as well is the secret to a happy winter. Baking together can be a great family bonding activity that also encourages your kids to use a bit of math with their measurements. Plus, not everything you bake has to be sweet and full of sugar. There are some great recipes online that kids will have fun making, and that you’ll feel great allowing them to eat. Sure, you don’t want your kiddos to spend the entire winter cooped up inside watching movies. But once a week or so, it’s a great opportunity for you to all relax and enjoy watching something on the big screen together. And while it can always be fun to actually go to the movies, kids are often just as happy with a rental at home. The rise of the Internet really has done away with the art of letter writing, but that doesn’t mean you can’t work to revive it with your kids this winter! After all, who doesn’t love getting a piece of mail that isn’t a bill? Sit down with your kids and make a list of people they would love to write letters to. Start with the obvious like grandparents, and then consider reaching out to old friends who live in other states and may have kids around the same age as your own. It could be a perfect pen pal pairing in the making! 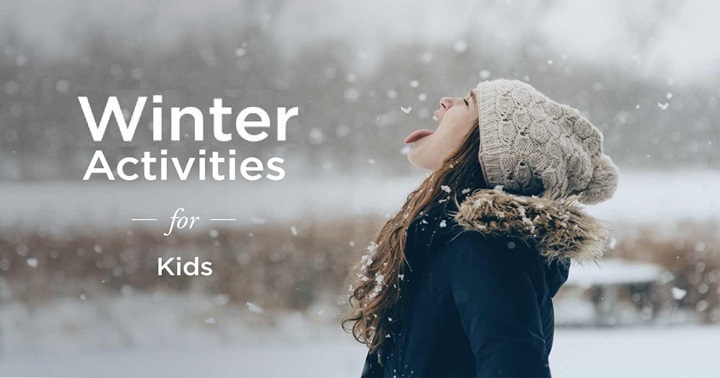 It may not always be safe to get outside with your kids in the winter, but that doesn’t mean you shouldn’t still be looking for ways to activate their little muscles. Indoor yoga can be a great way to keep kids in tune with their bodies, and to help them focus when being stuck inside has them feeling a little stir-crazy. Check local yoga studios to see if they offer any classes. Or try an at home sequence. Picnics Grab those muffins you baked and set the scene for a living room picnic. Let your kids handle the setup with blankets and stuffed animal guests and then arrange a spread they won’t be able to resist! Pull out the crafting supplies and make a book with your kids. Either have them write the story (or tell it to you, so that you can transcribe it) and illustrate it, or use family photos to create a picture book. This is an activity you could easily spend all day on (or several days, for kids who need lots of breaks in between), and one that will lead to an end product your kids will love. Uno, Monopoly, Go Fish, Battleship: It doesn’t matter what games are your favorite, your kids will love playing them all with you! Most kids would be thrilled to simply be decked out in their winter gear and set loose outside. Follow along with younger children, of course, but give them free range to explore and discover what the world outside has to offer them. Perhaps your children have started to take notice of some of the homeless people who may be huddled under blankets on street corners in your area. Considering enlisting their help in making compassion packages. Fill a shoebox with items that might be helpful to someone living on the street. Things like bottled water, hand warmers, and granola bars can be a great place to start. Then, keep those packages in your car to give to those you see on the streets in the cold winter months. Painting, coloring, building with clay? Give your kids a chance to create, and they are sure to thrive with the opportunity. Keeping healthy and safe in the winter months should obviously be a top priority. The National Institutes of Health make recommendations for vitamin D intake, particularly in the winter months when your kiddos probably aren’t getting as much sun. And there are some great recommendations for keeping safe and warm during outdoor winter activities. Remember, the winter months don’t have to mean kids bouncing off the walls and you pulling your hair out in frustration! Keep them active, engaged, and safe and there will be plenty of fun ahead for you all.